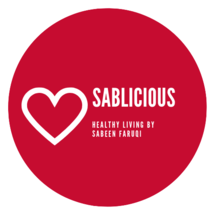 Sablicious Healthy Living was founded by Sabeen Faruqi, an experienced health and nutritional coach, to educate people about healthy eating habits and life style. She received her training from the Institute for Integrative Nutrition, where she studied a variety of dietary theories and practical lifestyle coaching methods. With her knowledge, you can co-create completely personalized actions based on your goals to move you toward your ideal vision of health within your unique body, lifestyle, preferences, and resources.